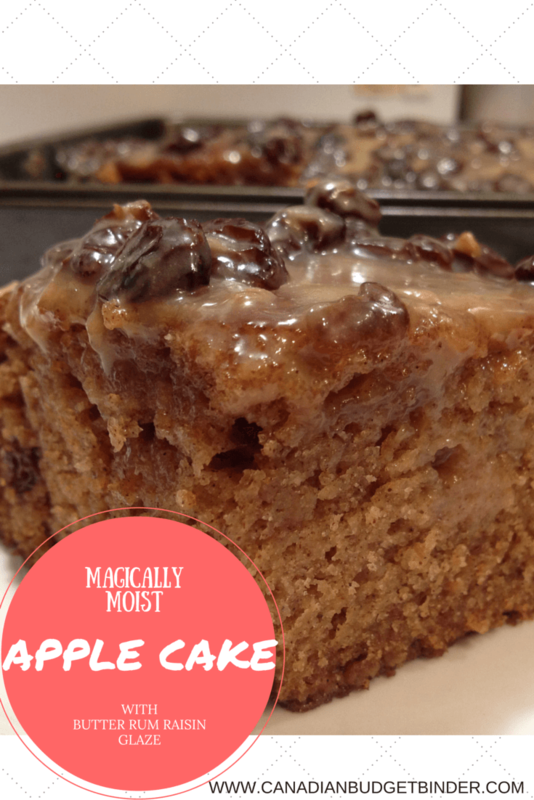 Move over every apple cake recipe you’ve ever made because there’s a new apple cake in town and it’s bringing along that magically moist bite that all cakes should boast about. This is a simple apple cake that is unbelievably moist because I combined two everyday pantry ingredients that seem to marry well together, organic coconut oil and homemade applesauce. The best part about this recipe is that it bakes a thick apple cake and six large muffins in one batch which is perfect for those of you on the go or for the kids. If you’re looking for a dessert to bring to a back-yard summer party this is a wonderful treat because you won’t have to worry about the frosting melting under the sun. I personally enjoyed the muffins at work for breakfast or a snack when I didn’t have time to prepare something at home because I was running late. Even our son who is particular about the muffins he eats devoured this apple cake and asked for seconds using baby sign language that we taught him as a baby. We only give him little pieces cut up but he’s our little taste-tester so if it passes by junior you know it’s a winning recipe. This has to be one of the best cake recipes I’ve ever created with fruit and one that I will repeat especially if I’m feeding a big crowd of hungry cake lovers. Our son is just like any other kid, one minute they love to eat something and the next it’s not on their list of good foods to eat unless it’s a sweet or salty treat. Our son fell in love with apples for about a day or so after we bought a few but that was the end of that journey. We’re almost certain he will get back on the apple path because of his love for this apple cake. Since my wife doesn’t eat fruit and I can’t keep up with it all either I needed to use up the extra McIntosh apples we had in the refrigerator. Making applesauce is very simple and for this recipe I needed 2 cups of spiced applesauce so I used 8 apples, peeled and cubed, 1/2 cup of water, 2 tablespoons of cinnamon, 1/3 cup of sugar and boiled it down until it was soft. I then got out our fancy $20 hand-blender and smoothed it out until it was creamy. It takes about 20 minutes from start to finish and then you should let it cool to use in this recipe. If you don’t fancy making homemade apple sauce you can certainly buy it pre-made at the grocery store. Your choice is sweetened or unsweetened and since this is a sweet apple cake you can opt for the unsweetened to cut back on sugar if you’d like. This moist apple cake recipe was inspired by a fresh apple cake recipe, “Caramel Apple Cake with Apple Cider Frosting” I found over at Country Pleasures Blog. It appears that Sue found her apple cake recipe from the blog, A Hint Of Honey. I took parts of the recipe to incorporate into mine as I was simply looking for inspiration although the original looks just as amazing. The batter for my cake includes coconut oil, whipped cream with differences in measurements. If you don’t have the caramel on hand it’s simple to make ahead and cool for this recipe. Food Network chef Ree Drummond has an easy caramel sauce the yields 1.5 cups which is great for this recipe as you can use the extra half cup for topping if you like. I also created more of a glaze frosting for the top of the apple cake using boiled condensed milk in the can to darken it up a bit and raisins soaked in butter rum extract and a bit of water for 30 minutes to plump them up. Any time I create a recipe I hope for the best because you really don’t know how it will turn out. Measurements for baking must be precise and although I know many of us get lucky at times there are those situations where a recipe will flop. This apple cake turned out spectacular although I had too much batter for my 9×11 cake pan which meant I made six large apple cake muffins as well. If you have a larger cake pan and want to experiment with the baking time go for it otherwise kill two birds with one stone and make a cake and muffins with this apple cake recipe. I baked the cake in the oven at 350 degrees for about 30-35 minutes. I always test with a toothpick to make sure it’s clean before I remove cakes or muffins from the oven. Once you take the cake from the oven poke holes in the top with a skewer or fork and pour the boiled heated condensed milk over the top along with a sprinkle of cinnamon and the butter rum soaked raisins. Once cool you can cut into squares, set on parchment paper in an air-tight container and freeze up to 3 months. Take out piece by piece to thaw and it will take you back to the moment it came fresh from the oven and cooled. I was shocked and every time I eat a piece of the apple cake I’m still shocked that it’s so moist and never ever dry!! Yep, that’s magic if you’re a cake baker. 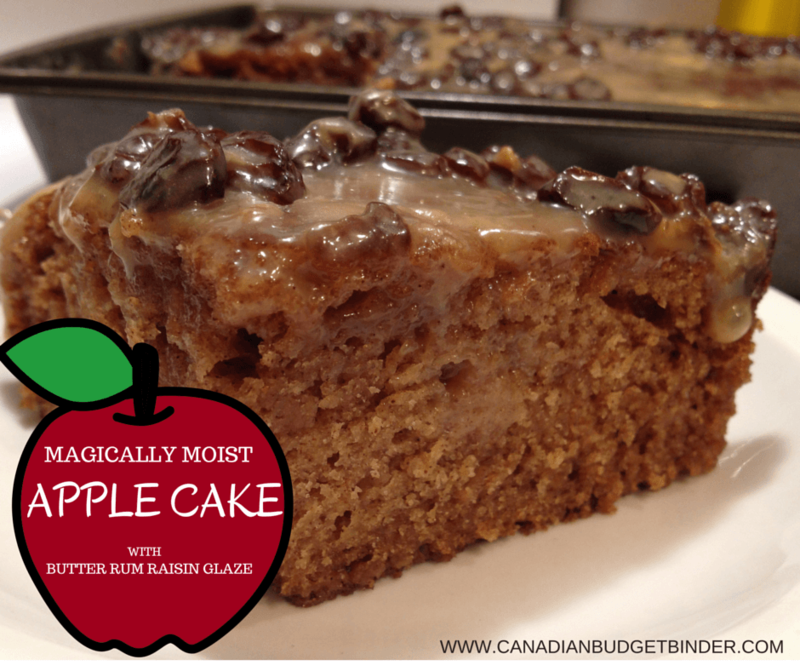 This apple cake magically stays moist and fresh even after you freeze and defrost it. A slice of this apple cake paired with a cup of coffee, tea or cold glass of milk makes the perfect snack or dessert. This recipe will make a 9x11 cake AND 6 large muffins both baked for 30-40 minutes or until a toothpick comes out clean. In a measuring cup add your buttermilk and to that add 2 tablespoons of white vinegar. Let it sit for about 10-20 minutes or until curdled. Stir and you're ready to use it. If you're making homemade caramel see recipe link in post for Ree Drummonds easy caramel sauce which makes 1.5 cups of caramel although you only need 1 cup for this recipe. You can use the rest as topping if you'd like. Otherwise store-bought caramel is fine. Bake at 350 degrees for 30-35 minutes. I like to check on my cakes around the 25 minute mark and again at 5 minute intervals. Once it comes from the oven poke holes with a skewer on top of the cake and pour your warmed can of condensed milk over the top, sprinkle with the butter rum raisins and add a bit of cinnamon if you like. Cool then cut into squares, add whipping cream on top, more caramel sauce or eat it as is! You can serve the apple cake as is or I like to top it with a bit of half and half cream or whipping cream. Add this to your recipes for apple desserts so the next time you have a few extra apples waiting to be used up you’ll make this apple cake first. Even when defrosted the apple cake is just as moist as it was fresh from the oven. 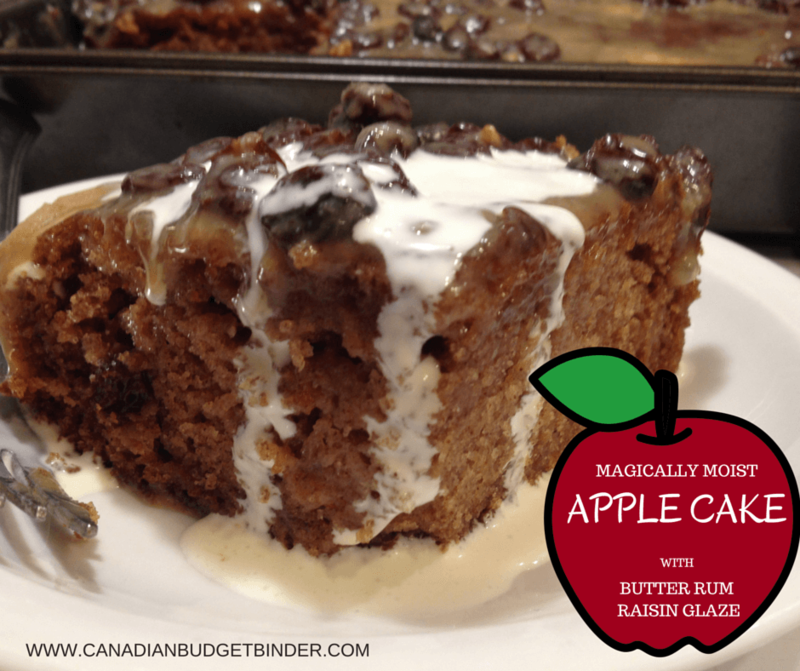 Magic apple cake is more like it!! The best apple cake recipe in the world is right here.